I'm having a bit of trouble with my brother's sweater at this point and I don't know if it's me or the directions. I'm going to try to explain my problem so that it can be understood by people who aren't knitting it, and I would love it if someone had an answer to my problems. 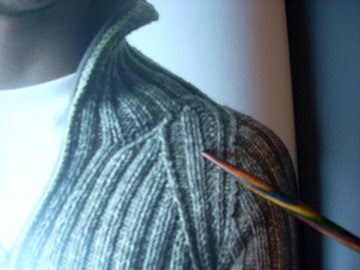 Here you see the top of the left side of the front of the sweater. Along the right side I've been doing raglan shaping 6 stitches in from the side (that's P2, K2, P2 - then decrease) and if you look on the left side, you'll see that there's neck shaping three stitches in from the side. Notice these two decrease lines are coming to a point. So here's where I'm stuck. The pattern states, and I quote, "decrease one stitch as set above [3 in from left, 6 in from right] on each end of next and every following alternate row until there are 12 stitches". Ok, check. I've done that. I now have 12 stitches. Here's the confusing part, "then continue to decrease one stitch at each end of every following alternate row until all stitches are worked off. Cast off." Ok, that sort of sounds like "keep doing what you're doing until there are no more stitches", right? The problem is, those decreases are going to run into each other if I keep going, AND the 3 stitches on the left and the 6 on the right wouldn't get eaten up. See where my needle is pointing? That's the P2, K2, P2 rib on the right side of the front, and it doesn't look like it ever goes away. You can also sort of see that the decrease lines do in fact come to a point ...and then continue up? I'm not sure. I'm stumped. I have no idea. Thoughts? I was thinking maybe whoever knit this substituted a double-decrease in the middle instead of decreasing on both sides, but I'm not sure. you should start decreasing the edge stitches. in the photo with your (very pretty) needle, you can see that the third rib in from the left gets eaten up at the very end. with the outer two ribs on the stitch holder this will be the edge stitches. 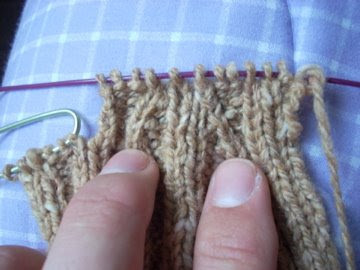 By doing this it will preserve the stitches between the existing decrease marks until the very end, as is shown in the picture. If this is all really confusing, just trust me that you should start decreasing at the edge of the 12 stiches you now have on the needle. 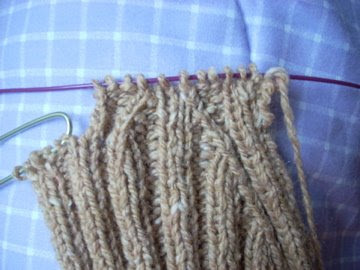 Ummm...maybe put all the stitches on a holder and knit up one of the sleeves? Then you can see how that will all fit together and do some re-jiggering if you have to. ...or do like TA says.